While Palestinians are being massacred — over 50 killed and close to 2,000 wounded as demonstrators are being met with live fire — Israel and America celebrate the move of the U.S. embassy to Jerusalem. That juxtaposition is revolting, but it is also revealing. The double standards of occupation and dispossession have never been clearer. Since March 30th, which marked Land Day — a day mourning the deaths of Israeli-Palestinians killed while protesting in 1976 — Gazans have repeatedly massed at their border with Israel, demanding the right to return to lands they were expelled from during the formation of Israel. They have been met with tear gas and live fire. While some of these Palestinians intended harm, they have been remarkably few and far between, a minuscule percentage of the tens of thousands of unarmed protesters. That is part of a historic pattern: Israel claims it only uses force when absolutely necessary. The evidence suggests otherwise. A hugely disproportionate number of Palestinians die, while few if any Israelis ever do (in this case: zero). Still Israel claims it is defending itself. It is a curious line of defense, one which reveals the very (troubled, and troubling) logic of Zionism itself. Zionism, broadly speaking, is the belief that the Jewish people deserve the right to self-determination, to define themselves collectively as so many other peoples do. Zionism, broadly speaking, is the belief that the Jewish people deserve the right to self-determination, to define themselves collectively as so many other peoples do. This, and the undeniable historic tie of Jews, and Judaism, to what is now Israel and the West Bank, is used to buttress the legitimacy of Israel. Now, these are important points. Why shouldn’t the Jews have the right to self-determination? And there are plenty of anti-Israel voices who do deny the historical connection of Jews, and Judaism, to what is now Israel and Palestine. Such voices are frequently anti-Semitic and, flatly, wrong. But the problem isn’t self-determination. It’s not historical connection, either. It’s that the Palestinians are indigenous. They were already there. Foreign settlers, whether they arrived before 1948 or after 1967, sought to enter that land — in order to transform that land into their own. Of course, that idea strikes us as outrageous, and rightly so. So why the double standard? This conflict does not have a military solution, and a moral and principled position would require us to apply to Israel at least the same standards that we apply to the Palestinians. Such an approach itself is an injustice (if even unavoidable): This is not a conflict between two equal and competing narratives. The Palestinians were already there. Sadly at this point, even to be evenhanded approach would be progress. 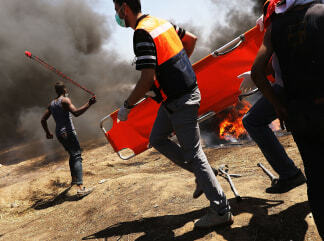 We see the incredibly insensitive spectacle of America’s elected leaders feting Israeli Prime Minister Benjamin Netanyahu and the president of the Anti-Defamation League (ADL) tweeting a selfie while dozens of miles away, a slaughter of the defenseless unfolds. Quite a victory it is. Relations between American and Israeli Jews are already in decline; the spectacle of anti-Semitic religious fundamentalists sharing the stage with a right-wing Israeli prime minister deeply hostile to the lived religious experience of most American Jews is certainly not going to help. Organizations like the ADL, with its already checkered record among Arab and Muslim Americans, might not want to ask after today why movements such as Black Lives Matter have successfully turned away. Americans have every right to reject this alliance, and propose in its stead a foreign policy that serves our interests, as well as our values. That means ceasing to hypocritically advocate in the Middle East what we would never tolerate at home for ourselves. The only future for Israelis and Palestinians that offers both security and dignity is a single state which shares some higher functions, and delegates others to its constituent peoples. Some might say this is a fantasy. Others might argue it undermines Zionism itself. My response is simple: Actions have consequences, and rectifying the wrongs inherent in building a nation on someone else’s land requires, at the very least, sharing that land in pursuit of a reasonable peace. And that is not delusional: While the lived experience of Native Americans and African Americans in the United States remains very troubling, we have made substantial progress in transforming the narrative of our nation to recognize the wrongs of history and policy. Israel’s leaders and supporters never tire of telling us how the country represents values shared by Americans. Well, our foundation values are equality and democracy. Israel is welcome to try them.